The teacher would prepare the lesson, stand in front of the students and deliver the information needed. 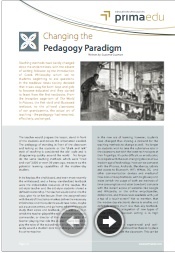 The pedagogy of standing in front of the classroom and talking at the students or the “chalk and talk” style of teaching is considered the old- style and is disappearing quickly around the world. No longer do the same teaching methods which were “tried and true” 3,000 or even 30 years ago, measure up the potential learning capabilities of the modern-day student. Prima Edu CARES was used to research, analyse, and provide feedback for Intel Corporation, SEC, and the Qatari Independent Schools and their usage of the Intel Education Classmate PCs. 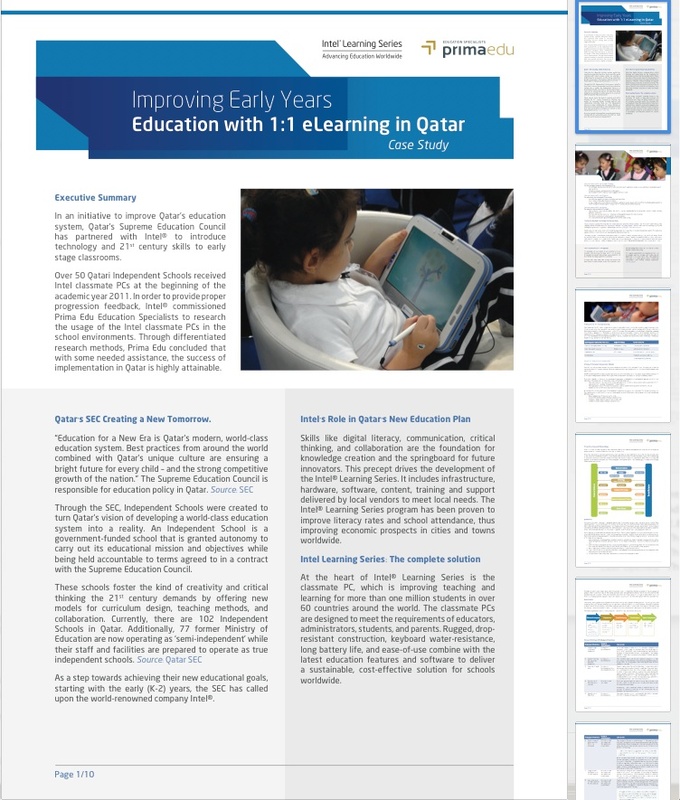 Following an initial case study, Prima Edu provided personalised CPD and Classroom assistance to improve the Qatari Independent School's usage of the ILS Classmate. Every school should have an Additional Education Support Needs (AESN) Policy which outlines the exact procedures the school will follow in supporting a child with AESN as this provides all staff and parents with a clear idea as to what the expectations are. The first thing to clarify is what is meant by AESN and what this term covers, in Qatar AESN covers students with learning problems, students with specific learning problems, students with specific learning difficulties, students with disabilities and students with behavioural problems. The admission procedure and how you integrate students with AESN to ensure the smoothest transition into your school. What facilities are already in place in your school to support a student with AESN. How you support all students in providing them with a varied and balanced curriculum which is inclusive and differentiated to meet the needs of all your students. How you work with parents to develop a positive partnership. Your procedures for how you identify and assess students you may have concerns about. Links you may have with outside agencies. All behaviour displayed by a child is a form of communication. Have you considered the reasons behind this behaviour? Is the child engaged in the classroom activities? Are the activities meeting the child's ability level? The environment: have you considered making changes to the classroom environment and recording what impact this has on the child's behaviour? How do you respond to the child? Have you considered changing your approach and using a different strategy with the child? Reward strategies such as stickers, reward charts, making a child the class helper for the day and praising the child who is demonstrating positive behaviour can have a positive effect on the whole class. Encourage children to reflect on their own behaviour and encourage them to explain why this is undesirable behaviour. Be a positive role model for the children and help them to understand why certain behaviours are not acceptable. Create class rules with the children so that they have a say and are aware of what the class rules are. Ensure these are displayed in a visual way in the class and have a positive focus so for example instead of putting "No running in the classroom" consider "We walk when we are inside". Be consistent with your approach to behaviour and ensure the same standards are used by all staff for all children. Advisory Teachers have worked in a number of different ways to help provide support to both children with Additional Education Support Needs (AESN) and to the staff within the schools. This work has included continuous professional development in the areas of Guiding Positive Behaviour, Developing an Education Plan and creating policies. Modelling sessions in classrooms have proved to be beneficial with Advisory Teachers modelling positive behaviour management techniques to both teachers and teaching assistants. They have also worked with small groups of children modelling activities and showing how these activities can be differentiated to meet the different needs of all of the children. We take great care in documenting our experiences for the greater benefits of our clients and people. Find out more about our products, services and engagements, click on the links to read synopsis. Please contact us should you require any further information on any of the case studies listed in this section.